Note: This post has been updated to include comment from Moore’s legislative office. N.C. House Speaker Tim Moore has a new job, after he was hired this week to serve as the attorney for Cleveland County, where he lives. One of his tasks in the county position will be to “[a]dvise the Board and Manager on proposed legislation,” according to a copy of Moore’s contract, which was obtained by N.C. Policy Watch. That could raise questions about whether the new job poses a conflict of interest for Moore, a Kings Mountain Republican. As head of the state House of Representatives, Moore has considerable influence and insider knowledge about state budget negotiations as well as other pieces of state legislation that affect counties around the state. 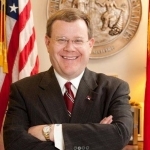 Moore’s legislative staff said that his county-based job will be limited to offering advice on proposed legislation in the county, and not any state legislation. The House Speaker job tends to be a time-consuming one, though all members of the legislature are considered part-time lawmakers with many still running businesses or going to jobs in their home districts. Moore makes $38,151 a year as House Speaker. The Shelby Star noted that when Moore was hired Tuesday at a county commission meeting, he made reference to his position in the state legislature. “Moore joked about having another job that gave him ‘some insight’ about what is going on in the state and communities but still had a law practice to keep up,” the Shelby Star wrote in an article about Moore’s hiring. Clayton Somers, Moore’s chief of staff, said Friday afternoon that Moore sought an informal ethics opinion before taking the job, and that the legislation referred to in the contract was only county-based proposals, not state legislation. “He is not going to advise the county on any state legislation,” Somers said. Moore will receive a $25,000 annual retainer, and will bill the county $250 an hour for whatever work he does serving as the legal adviser to the county commission, according to a copy of his contract obtained from Cleveland County by N.C. Policy Watch. The job will require Moore to attend commission meetings, consult with the county commission and county manager as needed and prepare legal documents and contracts, in addition to offering advice about pending legislation. “It just doesn’t look good,” said Jane Pinsky, the head of the N.C. Coalition for Lobbying and Government Reform, about Moore’s new contract employee job with the county. Even if the arrangement is legal and Moore operates in an ethical manner, it can still leave the public with the impression that those in political power are able to easily secure jobs because of their public roles, she said. “It’s one more thing that people think if you’re one of the good old boys, there’s a benefit to that,” Pinsky said.